On the evening before your pet's dental cleaning you should withold food after 10:00 pm. Water is okay overnight but please remove your pet's water bowl first thing in the morning. Your pet's day with us will begin around 8:30 am. We will ask you to sign an estimate and an anesthesia authorization for the procedure. We will then make your pet comfy in her own kennel. The doctor will do a brief exam, listen to her heart and lungs, and draw a blood sample for a preanesthetic chemistry test. We want to make sure your pet is healthy enough to be placed under anesthesia! The technicians will then place a catheter in your pet's arm and begin administering fluids. The fluids will make sure your pet is well hydrated and will also help flush the anesthesia from her system after the procedure. The catheter also allows for fast intravenous administration of medications if necessary. Usually we will schedule your pet's dental cleaning to be done in the mid to late morning. 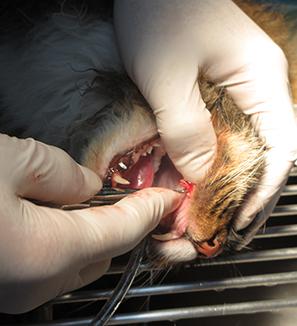 Your pet will be induced with an injectable sedative and then a tube will be placed down her throat to administer anesthetic gas during the procedure. 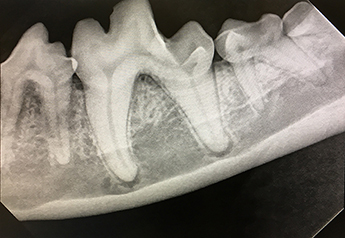 Digital dental x-rays may be taken to look for abscesses, fractures, or other dental issues that are difficult to discern with the naked eye. A technician, under the doctor's supervision, will then scale above and below the gum-line and polish the teeth. Periodontal probing will be performed to observe the structural health of the teeth and their roots. If any teeth need to be extracted, the doctor and technician will do so at this time. Some extractions are more complex than others. Which teeth need to be removed, how tenacious their roots are, and their degree of deterioration are all factors that can determine whether an extraction is simple or complex. More difficult extractions are associated with some pain after the procedure, but in the long run will eliminate that terrible toothache! Quite often we hear from pet parents that their pet is much more interested in play and food, like a puppy or kitten again! Your pet will then be placed back in her cozy kennel to recover. She will be closely monitored by the hospital staff to ensure she wakes up as smoothly and painlessly as possible. We will continue to administer IV fluids throughout the day to help speed her recovery. At this point, Dr. Popescu or one of our technicians will be in contact with you to let you know how everything went and assure you your pet is doing well. Your pet will be ready to go home later in the day. 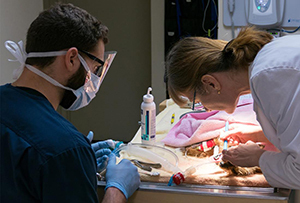 If your pet has had a routine dental cleaning with no extractions she will likely go home in the earlier afternoon and experience little or no post-op discomfort. A small portion of her regular diet can be offered in the evening and she can return to her normal routines the following day. If your pet has had extractions, she will stay with us a little later into the afternoon so we can monitor her recovery and level of discomfort. She will likely go home with some pain medication for the first few days post-op. She can be offered a small portion of food in the evening and normal portions can return the following day. However, she may need to be fed only soft foods for about one week while her gums heal. If the extraction was especially complex, or if the degree of infection severe, Dr. Popescu may request you bring your pet back in a week or two so we can monitor her progress.